Seismic Shifts – Can You See Them? Family structures have changed. My husband teaches 4th grade. In his classroom of 24 students, he has only 4 students who live at home with both their mom and dad. Everyone else lives in a varying family structure. Technology has advanced. Obvious as this one may sound, let me remind you that Apple only released its first iPhone in June 2007. Smaller community is more common – According to the 2009 Pew Internet and American Life Project, the average size of an American’s core network of close friends has dropped by 1/3 since 1985. Some studies suggest that loneliness is at an all-time high, affecting as much as 45% of the population. Now, take a step back and think about the youth you work with every day. Not only have they been impacted by these cultural seismic shifts, but they are also impacted by personal seismic shifts as well. Seemingly small events, some obvious and others not, can result in a seismic shift in behavior. We have all seen it – the barely noticeable but definitely occurring movements or the big explosions that catch us off guard. It could be a comment on social media, a picture shared without permission, the gain or loss of a part-time job, a change in the status of a long-term friendship. Even expected transitions such as starting high school, or the added freedoms that come with learning to drive or having friends that do – these all result in shifts. How aware are you of the small shifts? Do you see them when they happen? Do you look for them after the destructive quake has happened to see if there is a cause? Seeing the small shifts and processing them is instrumental in working with teens. The other aspect of seismic shifts is the reality that we can positively impact teens by purposefully having small, but meaningful interactions. It’s as simple as noticing when someone seems like they are having a bad day or remembering to ask about a situation that they mentioned previously. It could be providing a resource they might shrug off today but grab onto down the road. It’s showing up to an event or listening well to a concern. The opportunities to create shifts abound if we are looking for them. 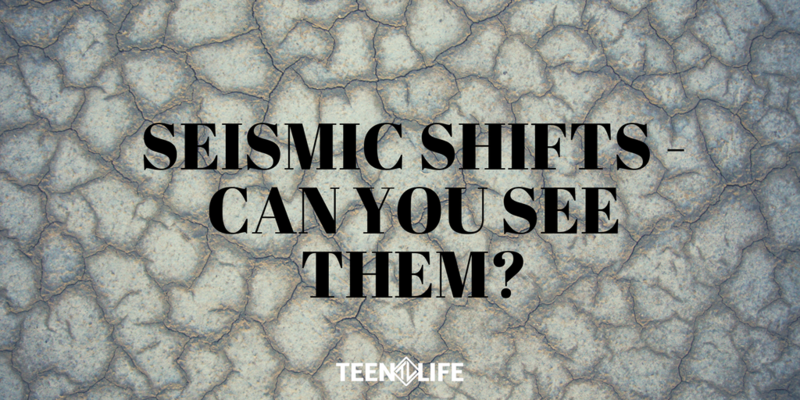 Do you see the seismic shifts in the lives of youth around you? Are you purposefully loving well and creating seismic shifts of your own?